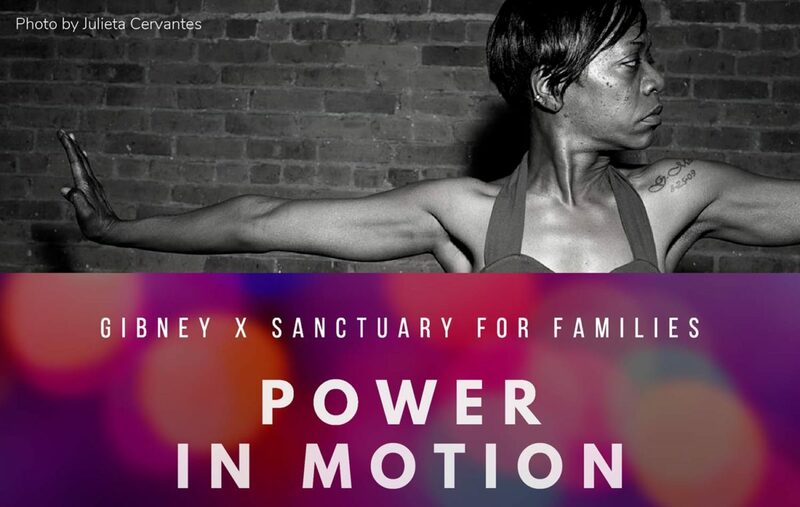 Power in Motion is a benefit featuring pop-up performances by Sanctuary for Families’ Survivor Leaders and Gibney Dance Company. Join us as we uplift voices of survivors of gender violence through the power of art and dance. If you’re unable to attend, please consider supporting this special evening. Gifts up to $2,500 will be matched by two dedicated Gibney and Sanctuary benefactors. For any questions regarding the event, please contact Chanel LeMond, Manager of Special Events, Sanctuary for Families (212) 349-6009 x366 or Terrell Finner, Development Manager, Gibney (646) 837-6809. Sanctuary for Families is dedicated to the safety, healing and self-determination of victims of domestic violence and related forms of gender violence. Through comprehensive services for our clients and their children, and through outreach, education and advocacy, we strive to create a world in which freedom from gender violence is a basic human right. Gibney is at the forefront of mobilizing the arts to address social justice issues. The organization’s highly respected programs use movement to transform lives through multiple platforms, including: Movement Workshops, which shares tools of choice, self-expression, collaboration and self-care with survivors of intimate partner violence; Hands are for Holding assemblies and residencies, which engage New York City youth on the topic of violence and bullying prevention; and Moving Toward Justice, which mobilizes artists to respond to social issues. Gibney values all that artists have to offer as makers, activists and entrepreneurs and allows these skillsets to flourish under one roof and reverberate back into the community.